This is my Daughter Bella (age 4) Dressed as Ariel, the little mermaid, and her trusty Sea Horse Khate. My daughter's favorite Disney Princess is Ariel, so we knew we would do some type of costume around that. My Mom, a Friend, and I came up with this idea. Next time I would have made the Sebastian and Flounder a little more visible along with covering her saddle better. But she looks adorable anyways and we had a blast! We have a winner! 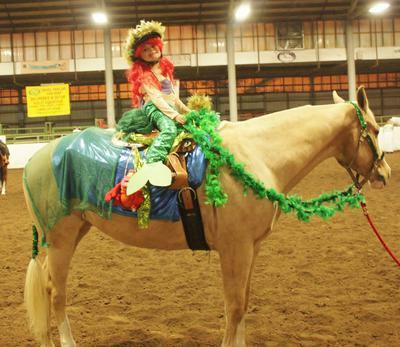 Congrats on winning the 2013 HorseCrazyGirls.com Horse Halloween Costume Contest! I don't know if you are still voting but if you are this is the one I am voting for. Who doesn't love a little girl and her pony especially when they look like this. Love the costume. Very cute idea! Looking good, Bella! Pick under the sea! so cute! I love this one! She looks so cute!! Good job!! By far the cutest and most creative.... I vote this one!!!!!! this is the winner! so cute how she did that! it almost seemed like she was riding a Sea horse! This is definitely my favorite costume. I would definitely choose this one! i love it i vote for this one. Ariel is my favorite Disney princess too! (well, Ariel and Pocahontas). I love mermaids and fairies. I think Under the Sea should win the costume contest. Love it, very cute and creative. Vote for bella inniss and her Ariel and seahorse costume! the cutest Ariel and sea horse I have ever seen! She did awesome by far the cutest out there!! We will start planning soon for next year. Your daughter was way too cute! Thanks for coming to our show. Great job on Bella's and Khate's costume! So very creative and cute!! This was a super cute costume!!! !